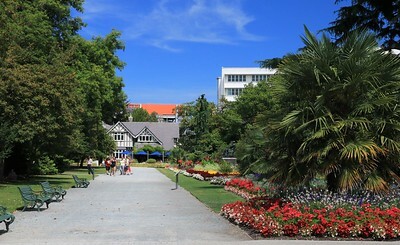 Christchurch is the 3rd largest city in New Zealand and is on the Pacific coast in the middle of the South Island. 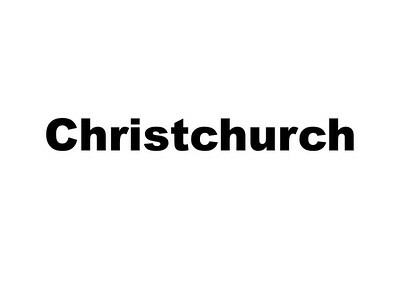 It was struck by major earthquakes in 2010 and 2011 and suffered significant damage and loss of life. They are still in the rebuilding stage. 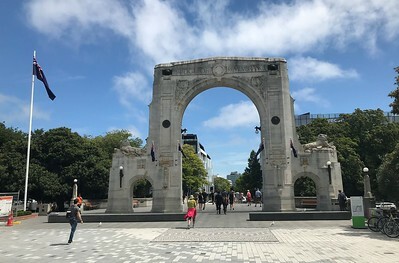 We entered the city of Christchurch through the Bridge of Remembrance, a stone bridge with a sculpted triumphal memorial arch to those who died in World War I. 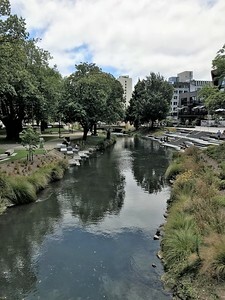 The Avon River as seen from the Bridge of Remembrance as it meanders through the city. 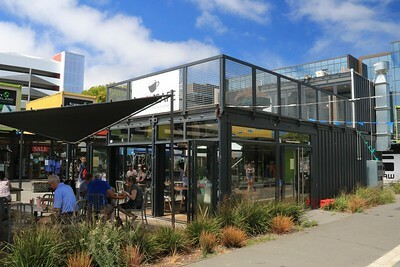 Our first stop was at the "container mall". 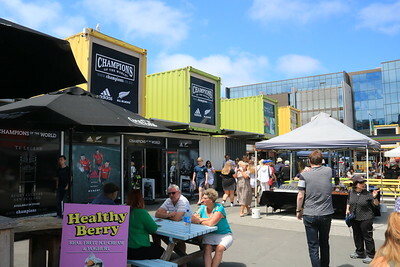 The earthquakes of 2010/11 caused so much damage that pop-up malls such as this were set up using shipping containers as stores and restaurants. This one was slated to be shut down a few days after we got there, some 6 years since the earthquake. 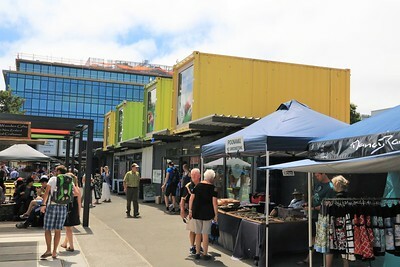 The container mall had a variety of shops and restaurants. 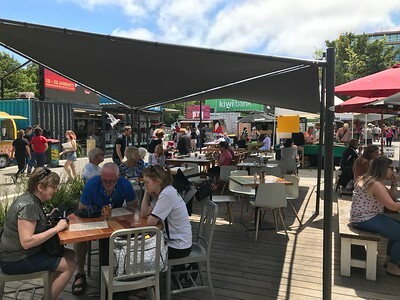 There were a variety of eateries, mostly with outdoor seating. We had lunch at this place in a semi-permanent building. 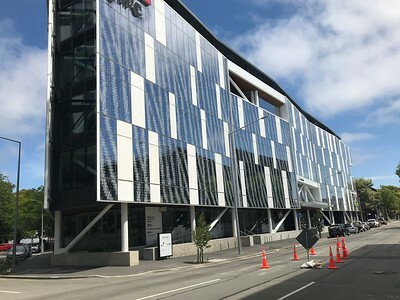 An interesting brand new modern building with a wavy façade. 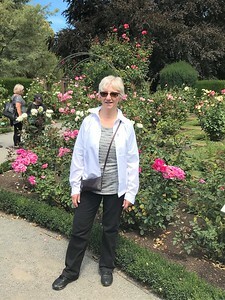 Our next stop was at the Botanical Gardens, a large park / garden adjacent to the city center. There was essentially no sign of damage from the earthquakes here. All the large trees survived. 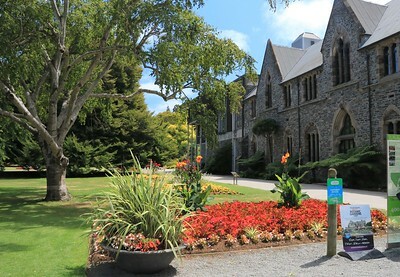 Beautiful flower beds lined the paths through the gardens. 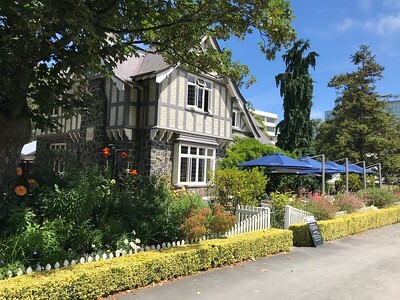 This pretty house is a restaurant called the "Curator's House". 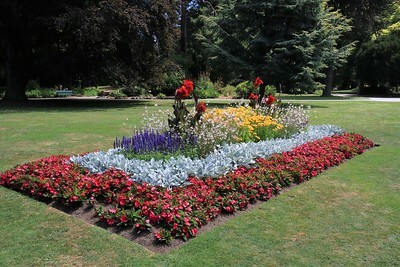 Beautiful flower beds throughout the gardens. 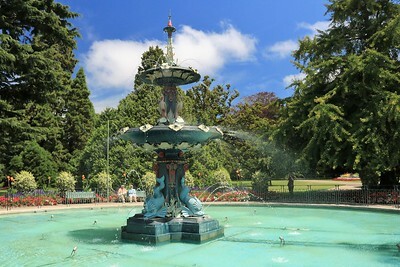 The Peacock Fountain is the largest in the Botanical Garden. 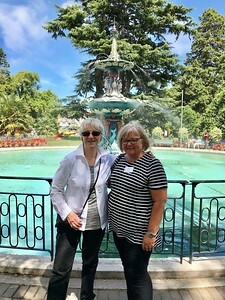 Ginny with Tessa, our guide, by the Peacock Fountain. 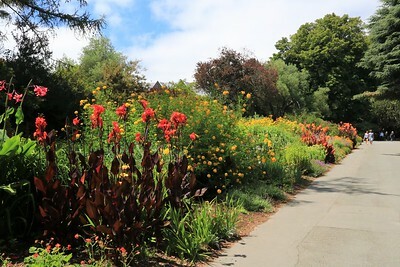 They called this "the herbaceous border". All the plants were perennials. 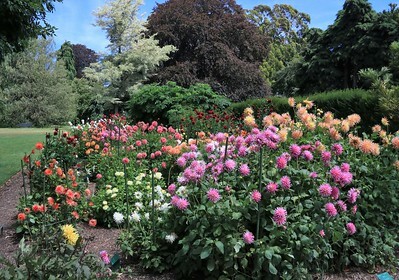 A large and long border of dahlias of all imaginable colors stretched a quarter of the way around the rose garden. 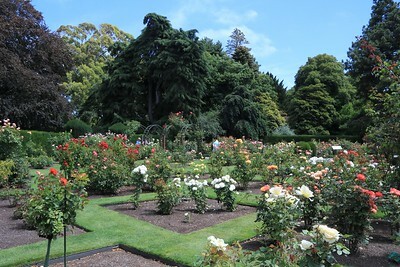 There was a large rose garden surrounded by tall hedges with entrances on each side. The roses were a bit beyond peak, but still quite impressive. 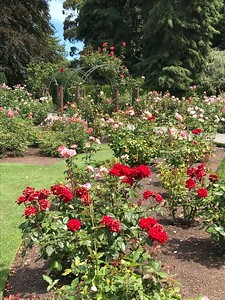 Colorful roses and one of the entrances with arched trellises. 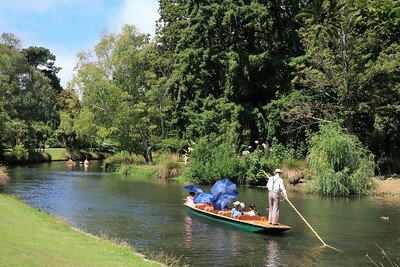 "Punting" on the Avon River. 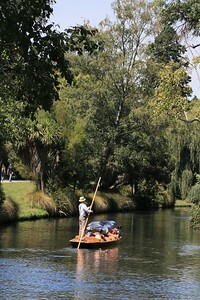 These boats were for hire for a leisurely boat trip through the city.